Soldiers from eight foreign militaries, including the US, will converge on Ukraine next month for the country’s largest aviation exercise yet. Starokostiantyniv Air Base, about 150 miles southwest of the capital of Kiev, will play host to some 950 personnel from the United States, Belgium, Denmark, Estonia, the Netherlands, Poland, Romania and the United Kingdom as they engage in the Clear Sky multinational exercise, Stars and Stripes reported Wednesday. The Clear Sky exercises will train soldiers in air sovereignty, air interdiction, air-to-ground integration, air mobility operations, aeromedical evaluation, cyberdefense and personnel recovery, Stars and Stripes reported. The announcement comes on the heels of the Ukrainian government announcing it would open a new military base on the Sea of Azov, a shallow body of water straddled by Russia's Rostov, Krasnodar and Crimea regions, but most of the north coast of which belongs to Ukraine. US President Donald Trump's special envoy to Ukraine, Kurt Volker, told the media Tuesday that "wherever" gaps in the Ukrainian military's capabilities exist, the US is "prepared to sit down and talk with Ukraine about what their needs are. They can buy things through our foreign military sales," Sputnik reported. Ukraine isn't a NATO member but has expressed interest in joining the alliance, which has slowly pushed eastward in the decades since the end of socialism in Eastern Europe. 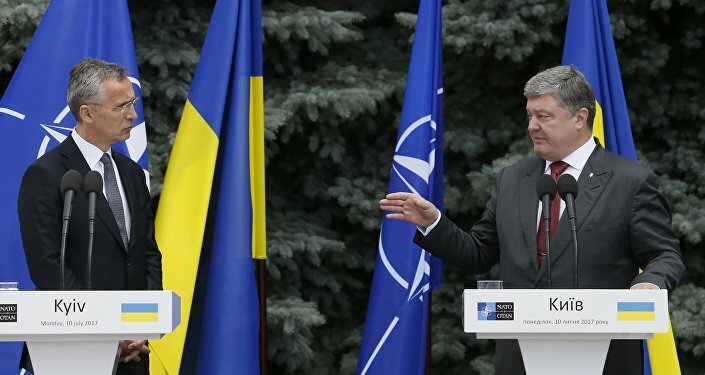 Ukraine's interest has grown in NATO since 2014, when a right-wing, pro-Western government was brought to power after pro-Russian president Viktor Yanukovych walked away from a trade proposal with the European Union in favor of a Russian alternative agreement. Late last month, US National Security Adviser John Bolton, returning from a trip to Kiev, told Reuters that Ukraine had made progress in its efforts to join NATO, but it still had work to do. Bolton told reporters that it was dangerous not to resolve the Ukraine crisis, referring to the Crimean Republic's 2014 vote to join Russia and the continued independence of cities in the Donets Basin.